With the proliferation of Flash games and animations out there, it’s a wonder more people aren’t reviewing them. Maybe it’s because any old hack can cobble together a short video with misshapen and completely stationary Mario sprites on a blank background, lace it with grammatically unstable poop jokes, suddenly end the video with a picture that may scar you for life and mislabel it as “teh awsommest mario battel evar! !1!”; why bother reviewing that? Because otherwise, somebody might accidentally watch it. That’s why. Fortunately, it seems any old hack can cobble together reviews about Flash games and animations, too—that’s where I come in. Every month I pick out a theme, find as many Flash games and videogame-related Flash animations pertaining to that theme as I can possibly tolerate, get hopelessly hooked on one or two of the games I find, and then crank out a short review for the ones that most warrant a mention. Read this column. Its contents will help you on your way. 4 = One of the best Flash games/animations you’re likely to see all month. 3 = One of the better Flash games/animations you might see this week. 1 = A waste of time. I watched it so you didn’t have to. You owe me. 0 = teh awsommest mario battel evar!!1! lolz. Length: Very short (less than a minute); continuous loop. 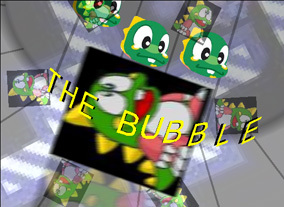 Description: A seizure-inducing collection of random Bubble Bobble-related images flashes across the screen while a thumping remix of the Bubble Bobble theme…um…thumps. Review: I guess some people actually like flash-frying their retinas. With dinosaurs. I feel a little like I plugged my eyes into an electrical outlet, right below the dinosaur nightlight. Ooh, hello, nausea. Verdict: 1/5: Too bizarre to rate any better, but too bizarre to rate any worse. Length: Short (around 1-2 minutes). Description: This is a harmless slice-of-life video about Yoshi. 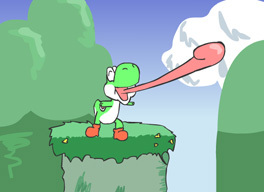 Well, Yoshi is a videogame-related dinosaur, so I guess it was inevitable that he’d show up here somewhere. And no, you can’t have more of a description than that, because it would give away the whole video. Review: Aside from griping that the audio quality could have been a bit better (sorry, videogame music purist), there’s really not much to say about this. It’s mildly amusing and pretty decently animated, but not memorable enough that anybody would bother to, I dunno, write a review about it. Verdict: 2/5: It’s cute. The end. Description: You are the last of the Mohicans. Erm… dinosaurs. 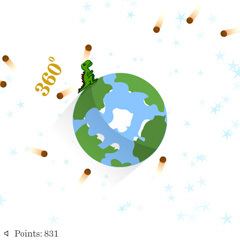 Circle the globe to rack up points while dodging the deadly meteors that are raining down on the Earth. If you mess up, it’s your fault there are no more dinosaurs. Review: This curious little game is an acceptable waste of a couple of minutes, but as soon as the repetitive music starts to get on your nerves, that’s the game’s subtle signal that you really don’t need to keep playing. Dodging the instant-kill meteors isn’t terribly exciting for very long, but dodging meteors while running along the side or bottom of the planet makes the game interesting enough to at least try out. Verdict: 2/5: An easy way to kill a few minutes…and a dinosaur, if you’re a complete failure. Description: The dinopocalypse is coming! Rescue as many dinosaur eggs as you can, gobble up smaller animals, and outrun the incoming storm…or become extinct! It’s kinda like one big escape sequence from Metroid. Better yet, it’s kinda like a prehistoric Sonic the Hedgehog, except you’re on the run 100% of the time and your little dinosaur doesn’t go around kissing human girls. Review: Good, retro-style fun: there’s fast-paced dino-hopping action, randomized levels, multiple paths, secrets to unlock, chances to upgrade your running and jumping abilities, controls so simple that even a caveman could figure them out, and no way to die except being overcome by the ever-advancing maelstrom of doom. Between the other dinosaurs scrambling for their lives, the meteorites falling from above, and the sky getting darker and more violent as the death storm is about to overtake you, it really does feel like the end of the world. Yay extinction! Verdict: 4/5: Surprisingly addictive; you’ll probably get a lot of mileage out of this game (it runs on fossil fuel). Description: Robot dinosaurs shoot beams when they roar. Review: The only thing more ridiculous than the concept of this game—flying a rocket-propelled dinosaur over city rooftops to destroy turrets and spaceships with your laser breath—is not liking this game. Sure, it’s short, the visuals are pretty basic, the dino roar is super-cheesy, the plot is utterly absurd, and microwaving a Pop-Tart is almost more challenging than beating this game, but that’s why it’s so endearing. The game hardly takes itself seriously, and neither should you. Verdict: 4/5: It’s silly, and it’s way more entertaining than it ought to be. Plus, you get to play as Meteo’s incredibly distant ancestor, Tyrannosaurus X. Aside from a slew of lackluster Yoshi’s Island parodies, there really isn’t much more videogame-related dinosaur Flash stuff out there. C’mon, people; I think it’s high time for Turok: The Musical. In Polish. And we need at least one Metroid Flash game where you play as Ridley, because Ridley is totally a space dinosaur. Gao.